Thanh Hoa is a peaceful countryside on the North Central Coast. There are 7 ethnic groups living in Kinh, Muong, Thai, Dao, Mong, Tho and Kho Mu - a multicoloured picture. With a special geographic location, this land is the epitome of Vietnam and is the convergence of interesting tourist attractions that everyone should visit once. Cam Luong fish cave (Cam Luong fish cage) is home to concentrated populations of densely populated fish that are preserved and revered by local ethnic minorities. This is a unique and popular tourist destination in the Thanh Hoa tourism route. On the way to the stream of Cam Luong Thanh Hoa, visitors will have the opportunity to admire the simple and rustic stilts of the Muong ethnic people lying hidden on the slopes, immersed in the majestic space of The towering rocky mountains, the point of the Ma River winding. Visiting Cam Luong stream, visitors will not be shy before the fish gods are swimming. As far as the foot of the mountain as much large fish, right in front of the cave is crowded the fish weighing 3-5kg swim close together, sealed the water surface, gathering on the shore as welcoming visitors. Here, visitors can buy some vegetables and popcorn from the people around to familiarize themselves with the fish. The fish here is very bold, see the food is back, click on the water surface, feeling like there is no distance between the fish and this god. The shape of the fish looks beautiful, black scales, dark mossy back, body stretched in the middle, the fins and mouth are pink. Interesting that you can put your hands on the water stroked these gods. In addition, to admire the spirit, visitors can also explore the cave tree on the Truong Sinh Mountain, at 70 meters above the ground. Inside the cave is a variety of stalactites with sparkling colours, and the depth of the heart like no endpoint. The murmuring of the small stream nestled on the wall suddenly attracted the attention of tourists, that is the origin of the water stream of Cam Luong. If time permits, visitors can visit the village around the stream of Cam Luong fish, exchange, learn the customs and habits of the people of Muong with features such as brocade weaving, dance Pong-pong and enjoy the local specialities and wine yeast need to ecstasy. 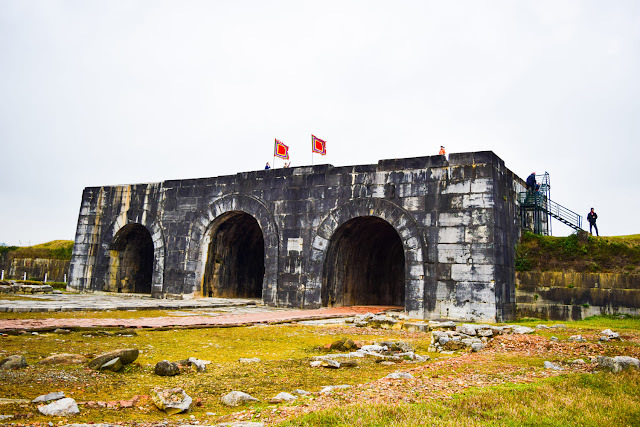 The Ho Dynasty Citadel in the province of Thanh Hoa today was the capital of Vietnam from 1398 to 1407. This is one of the rare stone fortifications left in Southeast Asia. UNESCO has recognized Ho Dynasty Citadel as World Cultural Heritage because of the cultural, historical values and unique construction techniques of this project. This work is highly appreciated in terms of technical stone blocks that are considered to be unique in Vietnam in particular and in East Asia and Southeast Asia. They have been described in the period from the late 14th century, early XV century. Researchers estimate that the architecture of the Ho Dynasty citadel was very scientific, with large blocks carved squarely, interlaced in the shape of grapefruit to avoid large vibrations such as earthquakes. Particularly between these stones, there is no binder but the citadel survives more than 600 years, overcoming the effects of seismic and bomb damage. In addition, this solid construction block was built only in the first three months of 1397. According to the materials left behind the archaeological work, the current status of the population of Ho Dynasty Citadel including Thanh Noi, Hao Thanh, La Thanh and Nam Giao is located outside the city. In it, the citadel is the most monumental and most intact remains to date. The entire exterior of the wall is a combination of four gates made from blue limestone slabs, carefully chiselled, stacked together. These large blocks have slabs of up to 6 meters long, weighing about 20 tons. Explaining the way these huge stone blocks were transported, archaeologists have suggested that rock marbles were used to transport them. Ho Dynasty Citadel is an important historical relic of high cultural value, ancient architecture. Come to this monument, visitors have the opportunity to admire the uniqueness of the old works and learn about this elaborate technique. This is the destination increasingly attract many domestic and foreign tourists know.